Original and unique woven textured pattern on titanium. Like a fingerprint or a snowflake each ring is a one of a kind. After you add your item to the cart. See "Note's to Romas Banaitis" to give your ring size, band width, finish and color choice. You can customize your band by choosing any color you see in my shop. The available colors are Purple Wine, Passion Pink, Mystic Purple, Sunset Purple, Immortal Green, Golden Fleece, Bronze, Nightfall Blue (the darkest blue), New Beginning Blue (medium shade of blue), and Sky Blue (the lightest blue). The colors do have some variables from the photographs on the computer screen to the real object in hand. The anodized color on titanium is iridescent. It will vary slightly in different lighting and as the angle of view changes. I am an artist and craftsman. I take pride in creating quality bands. For twenty years, I have studied the art of jewelry making. I custom make each band individually to your specifications. I combine traditional craftsmanship with modern materials to create unique jewelry. I use USPS Priority 2-3 business days with tracking #. FEDEX shipping is available for both domestic and international. Please convo or email me your request along with your City and Postal Code and I can calculate your shipping. I use USPS First Class International 10-20 busienss days. It is the most affordable way to ship your rings. Please note, the packages have limited tracking and your local postal service provider will deliver the package one it clears customs in your country. If you want to upgrade shipping to FEDEX with a tracking number, please contact me with your request along with your Country, City and Postal Code and I can calculate your shipping. Import Taxes and Custom Duties are not included in the price. Import Taxes and Custom Duties are the buyer's responsibility. You can check with your country's customs office to determine what these additional costs will be. These charges are collected by your local delivery postal service , shipping company or postal office. Each ring comes individually packaged inside a black paper ring box. The ring(s) and ring box(es) are packaged safely inside a cardboard shipping box. Your happiness is important to me. I will work diligently to ensure you receive the band(s) you desire in a timely manner. Feel free to convo me with any questions or custom requests. Named after the giants of Greek mythology, titanium is lightweight, extremely strong, hypoallergenic, noncorrosive and dent resistant. It is stronger than steel, but 45% lighter in weight. In the military, it is used with tanks, submarines, combat helicopters and propellers. In the medical world, it is used for surgical instruments and implants. The natural color of the metal is between platinum and white gold when polished. Anodizing or adding color to titanium is the process of using electricity to create a thin layer of metal oxide on the surface of the titanium. The thickness of the titanium oxide layer changes the wavelengths of light that are reflected from its surface, altering its color. Color on metal is a fun, unique and interesting way to create contemporary jewelry. The anodized color does scratch on abrasive surfaces. Rings are meant to be worn every day and will develop an antique finish, tarnish or fade over time. If you are concerned about keeping your band looking brand new, I offer refinishing and re-anodizing of colors, no extra charge. You can also request to have any of the rings listed in my shop made without color. Sizing is so important. You will be wearing your band forever, so take the time to have it sized properly. There are two options. First, you can order a reusable ring sizer from my shop for $3.50. I would recommend choosing the ring sizer gauge that fits snug over your knuckle. I can make the necessary adjustments according to interior fit and ring width. A comfort fit ring will fit and feel a little looser than the plastic ring sizer. Fingers tend to shrink and swell from morning to night , in cold and warm weather and from weight gain or loss. It is best to measure once in the morning and once at night to get a feel for the shrinking and swelling. You will need to pick a size in the middle. Also some people like a tight fit and others a looser fit. The second option is to visit a jeweler. I suggest being sized by a 2 different jewelers to confirm an accurate size and to get a feel for ring width and fit if possible. I can make rings in sizes 1-21 including quarter and half sizes. Titanium cannot be soldered, which means it CAN NOT be resized. I guarantee my bands are made to perfection. If the size given to me is incorrect, I will need to remake the band. You will be responsible for 50% of the sale price, plus shipping. Please contact me immediately and I will start working on your new band. You can order a reusable ring sizer from my shop for $3.50. I would recommend choosing the ring sizer gauge that fits snug over your knuckle. I can make the necessary adjustments according to interior fit and ring width. A comfort fit ring will fit and feel a little looser than the plastic ring sizer. Fingers tend to shrink and swell from morning to night , in cold and warm weather and from weight gain or loss. It is best to measure once in the morning and once at night to get a feel for the shrinking and swelling. You will need to pick a size in the middle. I can engrave the band(s). The engraving is $3.00 per character. For the font, I use Block (uppercase) and Upright Script (upper and lower case). The font height can be 1mm or 2mm depending on the size of the band. Single or double hearts are also available. If you request engraving on an anodized surface , the engraving will be cut through the color exposing the natural color of the titanium. If you request your ring(s) to be re-finished in the future the engraving cuts will be anodized the same color of your ring(s). Kindly convo me and I will set up a custom listing or use the link below. Scheduling is based on a first come first serve basis. Please refer to the top of my Etsy Shop Home page for current turn around times. I offer a lifetime warranty for all of my bands. I guarantee the highest quality and craftsmanship. If, for any reason, you are not satisfied with your purchase, I will be happy to return your money upon receipt of the band. Kindly notify me within 30 days after receiving the band. Soapy warm water and a cloth is all you need. DO NOT use toothpaste, strong detergents or chemicals. I recommend not wearing your band at the beach or while doing manual labor. Remove your band when using abrasive materials, as it can damage the color and/or finish. 1. Will the color come off? All rings that are worn everyday will scratch and dull over time. Anodized titanium is considered a surface finish, like a mirror polish, matte or satin finish. Surface finishes are susceptible to being scratched. If you wear your rings while working with your hands, washing dishes, gardening or playing with sand at the beach, the finishes will scratch off. 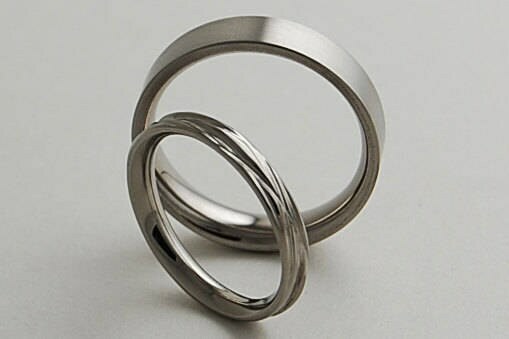 Although titanium is very strong, the color or surface finish can scratch, dull and fade over time. If this happens, you can send me your band(s) and I will retouch the color and refinish your band, no charge. This is a service I give to all of my customers. You can send your ring(s) to the address below. Please notify me that you are sending your ring(s) to be re-finished. 2. What happens if the band doesn’t fit? I guarantee my bands are made to perfection. If the size given to me is incorrect, I will need to remake the band. You will be responsible for 50% of the sale price, plus shipping. Please contact me immediately and I will start working on your new band. 3. When should we order our wedding bands? Order your bands as soon as possible. Why wait? 4. Is Titanium scratch resistant? Titanium is more scratch and dent resistant than other metals, but over time it will develop small surface scratches. 5. Can a titanium band be cut off in an emergency situation? Yes, it can. Please note, I am not responsible for an injury related to wearing the bands purchased from this shop. I use USPS Priority 2-3 business days with a tracking number to ship rings. I use USPS First Class 3-5 business days to ship ring sizers. FEDEX shipping is also available for both domestic and international. Please convo or email me your request along with your City and Postal Code and I can calculate your shipping. I use USPS First Class (2-4 weeks) for international. It is the most affordable way to ship your rings. Please note, the packages DO NOT have a tracking number. If you want to upgrade shipping to FEDEX with a tracking number, please convo or email me your request along with your Country, City and Postal Code and I can calculate your shipping. Each ring comes individually packaged inside a black glossy paper ring box. The ring(s) and ring box(es) are packaged safely inside a cardboard shipping box. 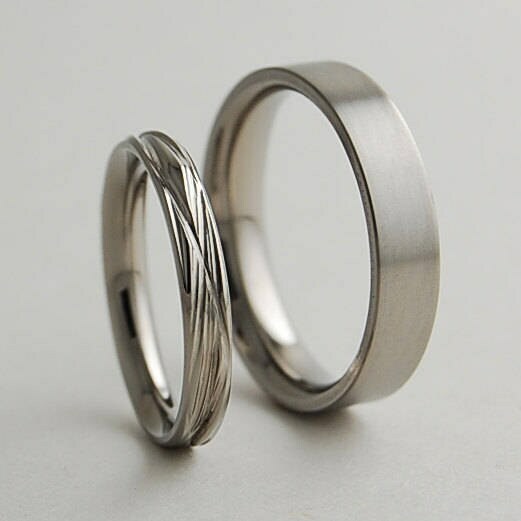 Titanium can not be soldered, which means it CAN NOT be resized. I guarantee my bands are made to perfection. If the size given to me is incorrect, I will need to remake the band. You will be responsible for 50% of the sale price, plus shipping. Please convo me immediately and I will start working on your new band. To place your order, you must provide me with certain information (which you authorized Etsy to provide to me), such as your name, email address, postal address, payment information, and the details of the product that you’re ordering. You may also choose to provide me with additional personal information (for a custom order of jewelry, for example), if you contact me directly. I do not share your data. Beautifully crafted rings. We love them!! We love our rings! So beautiful :) 100% would recommend. We are getting married in Vegas in July and decided that we both wanted just bands. I'm not super into diamonds and wanted to do something different. We started searching on Etsy because we like to support small businesses and anything handmade. Romas Banaitis was the first shop we clicked on and fell in love with the rings. We thought we should keep looking but weren't as excited. This shop really spoke to us. We were very surprised at how fast it all happened. We ordered on June 2, June 19 shipped, June 21 they arrived! They are so perfect. We went with mystic purple on the inside which turned out amazing. Communication was amazing, he got back to our email very quickly and it was just a very stress free experience. I keep getting my ring out to look at and can not wait until I can wear it every day! Thank you! These rings are everything we hoped they would be. Perfect fit, and so comfortable. I'm beyond impressed. Rings came exactly as pictured and very quickly. I would definitely recommend Romas! !